Long before the LoHi nickname became commonplace, 32nd and Zuni was one of Denver's great old school corners. OK, it still is a great corner, though in a much newer way-- and anytime a neighborhood gentrifies as quickly as this one has, old businesses shut down and new ones open up that completely change the face--and soul--of a neighborhood. 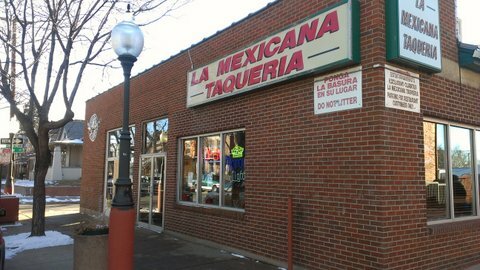 For example, now gone for some time is a place I wrote about just a couple years back: Loncheria Mexicana, which served, among other Colorado Mexican standards, a quality, smothered carne asada burrito. 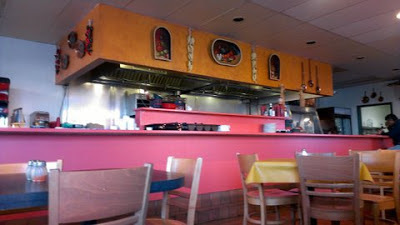 The funky, small space sits unoccupied again, but I can't imagine anything quite as--well, Mexican-- will replace it. There is nothing necessarily wrong with that, but it's worth pointing out--and thinking about: a unique, diner-style, family run Mexican lunch spot is gone for good. Looking back some years, the Aztec Sol was one of the first attempts at some of this gentrification-- a sort of edgy mix of Mexican bar with a large tequila selection and a few modern twists to try and attract some of the newer and younger residents. It was actually a nice attempt to blend the old with the new that was inevitably coming, but sadly it didn't make it, and now in its place is the perfectly fine, but slightly plain, Highland Tap. Our friends, who live just steps from what was Aztec Sol and is now Highland Tap, had a stray bullet hit their house seven or eight years ago. They sometimes joke about preferring the old sounds of occasional gunfire to the continuous parade of loud drunks leaving the Tap at two in the morning. Of course flying bullets are not something anyone should have to live near, and besides less random violence, gentrification has also meant a slew of great restaurants and options for families that never existed before. But when a neighborhood starts to lose everything that it once was in a period of just a few years, it's hard to think that is good either. Enter Mexicana Taqueria which, despite having its adjoining mini-mart turned into a trendy bike shop, sits undisturbed. It's not historic like some of the disappearing Italian joints that also dot the hood, but it's been around since 1996, which is like ancient history as fast as Denver has been growing over the past few decades. I hadn't been to Mexicana since starting this blog, so we did a slow drive-by before heading in just to make sure it was still there. Gladly, it was. La Mexicana Taqueria is the kind of place that greets you in Spanish. The clientele also mostly speak Spanish. Although, incredibly friendly and welcoming, there are little to no attempts to cater its menu or services to anyone other than those coming in for a good meal of unpretentious Mexican. 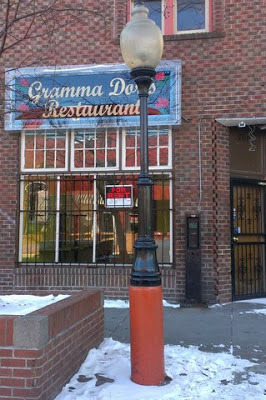 We had never been there for breakfast, and rolled in just as it was opening (8:30am) with babies in tow. The breakfast menu is rather small at La Taqueria--just five items--with four being egg dishes like huevos rancheros, and one a plate of cheese enchiladas covered in fried eggs: enchiladas montadas. I ordered that and it was pretty damn good--though one egg was fried over-medium and the other came out over-hard, but the red salsa was excellent. My wife, in a half-asleep homage to her new-found Colorado Mexican side, ordered tacos dorados, which came out, of course, as three fried tortillas in a half shell, filled to the brim with shredded chicken and topped with lettuce and crema. Being Mexican Mexican, she was expecting little rolled-up taquitos or flautas; but apart from the shape, they were the same thing. And they were actually very good. 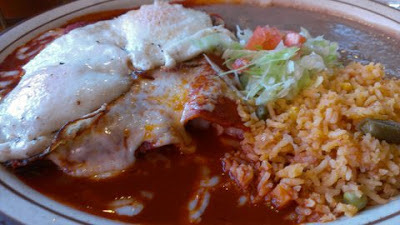 The tortilla was freshly fried and the chicken, which is often so plain in many taquerias, was well-flavored and moist. 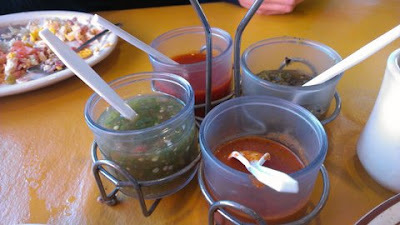 The highlight, however, and what I remember from my other trips to this restaurant, was the table salsas. Breakfast, with its limited selection, is probably not the best meal to enjoy at Mexicana Taqueria, but the place was starting to fill up when we left. 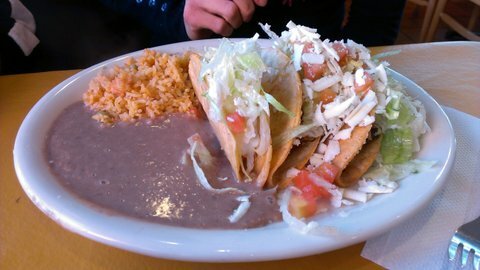 However I do remember loving a smothered burrito, a chile relleno and a plate of tacos I had there years ago. I, for one, like it enough that I will visit again soon--though I must admit it will be in part because I just want it to keep being there too. Places like the Mexicana Taqueria are fading away fast, and they offer the potential to be a bridge between the new and the old in a quickly changing neighborhood like LoHi--and what better way to build bridges than over a plate of enchiladas? (Or down the street at Panaderia Rosales over some freshly baked pan dulce?) Gentrification is inevitable and entrepreneurship via capitalism is not at all sentimental or nostalgic. That being said, patronizing places like this taqueria--which makes great food at great prices--is a way to keep some of that old flavor around. That might not be important to everyone, but all too often we don't know a good thing until it's long gone.